Our transportation department makes sure our students arrive safely to school and back home again. They are a group of caring individuals who want the best for your child. If you have any questions or concerns, feel free to contact our office. 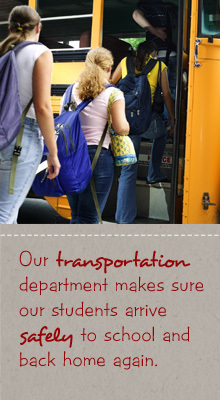 Student transportation is a qualified right dependent upon good behavior. As bus drivers are responsible for the safe operation of the bus, students are responsible for their behavior. Bus and school rules apply. lose riding privileges for a period of time or permanently. students riding a bus may be suspended from the bus due to unruly behavior. We require every student that wants to get on a bus to wear his/her student ID. Students receive the bus schedule during registration. It is also available at the district office. In the mornings, we will drop off Santa Cruz students in the bus loop. Buses leave Santa Cruz at 3:40 p.m.
Students who ride the bus may wait in the cafeteria, gather in the patio area, or meet with a teacher. Students riding the bus must board at Santa Cruz. If you want to know the school boundaries, please look at our map.